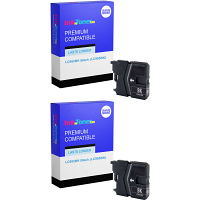 Brother DCP-J125 Ink Cartridges For the most affordable and HIGH-QUALITY Brother DCP-J125 ink cartridges around, come and get them right here at InkNTonerUK! 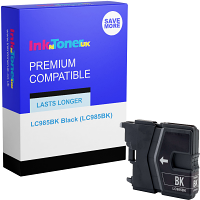 InkNTonerUK solemnly promise that ALL products that you'll acquire from us, in this case with reference to your NEW Brother DCP-J125 ink cartridges will present you with nothing less than the utmost high standard of prints EVERY TIME! Use your NEW Brother DCP-J125 ink cartridges to emerge clear/vibrant prints of imagery and documentations, at swift paces providing productivity, speeds of UP TOO; 33 PPM (Prints per minute) in Mono (B/W) and UP TOO; 27 PPM in Colour amongst a range of all-embracing purposes. InkNTonerUK are eminently proud of our highly competitive prices, and make our prices as hard as possible to beat by seeking through the market, investigating who and what our leading competitor rates are at that time, then set our prices in order to beat these. Not only this, but each and every individual product available for purchase on our website has been filled to the max of INK or toner, providing a GUARENTEE that your NEW Brother DCP-J125 ink cartridges will be of the greatest possible value around! 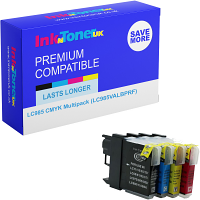 InkNTonerUK also aspire in giving ALL of our patrons the BEST in quality products, and make sure we do this by setting ALL of our products through for testing before sale; this testing certifies that your particular purchase (Brother DCP-J125 ink cartridges) won't EVER leave dissatisfaction in the results they generate! So what downfalls are there with purchasing your NEW Brother DCP-J125 ink cartridges and any other printing consumable that you may need from us right here at InkNTonerUK!? - Quite simply NONE. 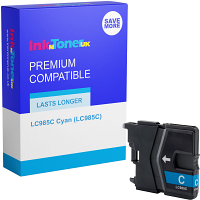 Join the extensively globalized clientele that InkNTonerUK have developed over time, purchase your NEW Brother DCP-J125 ink cartridges today, and be just another forever gratified customer from our selection! 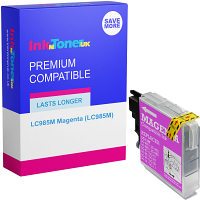 To secure InkNTonerUK as the retailer you obtain your NEW Brother DCP-J125 ink cartridges, and forever have a simple 'one-click' accessibility in getting right here where you are currently, we suggest that you 'Bookmark' this page NOW, and avoid any possible confusion in the near future!